Text Realms is a Virtual Reality Browser that will grant you access to an internet of text adventure! If you love to read and explore virtual realities, then the process is simple. 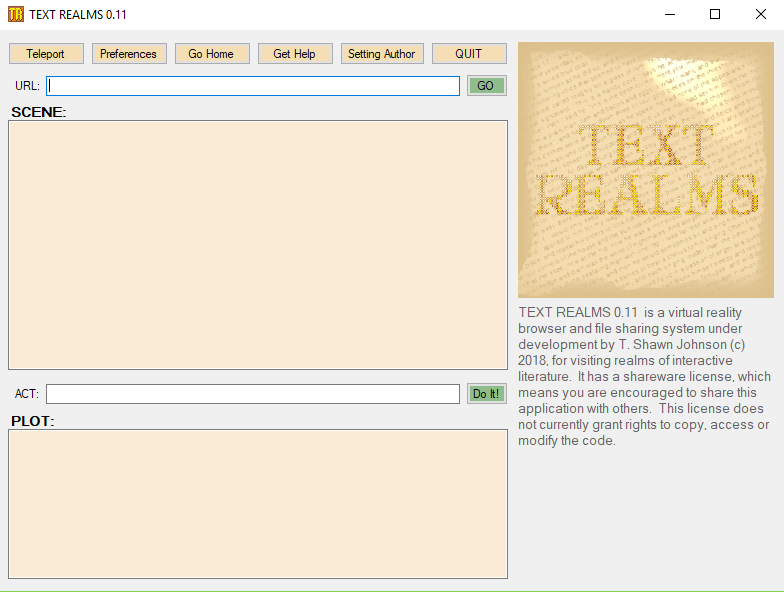 Download Text Realms. Open it. Type the web directory of a valid Text Realm in the URL field. Click GO. You will then see a description of the first room in the SCENE area. You can interact with elements of the scene using commands typed into the ACT field (ie. look at something interesting). If the author programmed that command into their Text Realm, then the result will appear in the PLOT area. 1. Make a Directory for your scene: If you love to write and would like to author a Text Realm, first you need a webspace where you can build a directory. Each directory will hold one scene. Perhaps the room you are building is a billiards room. So you might call the directory "Billiards_Room". And when someone visits your room, they will type http://www.yourwebspace.com/Billiards_Room into the URL field to go there. 2. Make description of your scene: The scene is identified by a text file that you can write easily in notepad to artfully describe what the scene looks like. You must call that file room.txt (all lowercase, otherwise an error will present). Put this file into the "Billiards_Room" directory of your webspace. 3. Make descriptions for props in your scene: Next, you will need to make more text files that describe elements of your room. For example, if you want people to be able to look at a wooden desk in the room, you will make a separate text file describing that table as you like, and when they type "look at desk", they will see that description in the PLOT area. You can name this file whatever you like, as long as it ends with .txt . Likewise, if you want a reader to be able to open a drawer in that desk, you will make another text file describing what they see when they type "open drawer". Words are the most accessible means we have to communicate. You can see them. You can hear them. You can even touch them in some circumstances. The cutting edge virtual reality systems, however, focus almost exclusively on the visual. Things are changing rapidly as we get closer and closer to visual reality in visual virtual reality, and we are spending billions of dollars and megawatts of energy to make that happen. Don't get me wrong, I'm a huge fan of Visual VR. It has served me well in business as a developer. And I have experienced many MANY visual VR platforms that have come and gone. What will we have at the end of it? Will it be worth the effort? Are we wasting our time with a particular platform only to have it dissapear as so many others have? These are all valid questions with no satisfying answers at this stage. And what happens when visual VR is identical to visual reality? What will that accomplish when we already have it in reality and in our dreams? It's all uncertain. Children are not being taught to write them. They are not being taught to comprehend them. Writing and comprehension are at an all time low. Do we even need to talk about speeling, and, proper-use of punc'chew-ation;! And I tell you this as someone in the business of making games. We are finding that players are not reading more than 5 words without feeling the need to skim. We are hearing terms like "reading fatigue" when people are faced with more than paragraph. And certainly, if you've gotten this far on the page, perhaps you are experiencing it now if the only reading you've done lately is the texts you get on your phone or facebook :) But good on you! You've gotten this far! We need to foster the writing and reading of words, because they can foster communication and imagination like -no- -other- means of -communication- for -everyone- of -any- ability. There are plenty of hobby sites out there that allow you to write text adventures and save them to those sites. And there are software packages that allow you to keep track of your words and plan your adventures. These are great. But, as authors, we like to be in control of our words. We like to know that the time we spend writing virtual realities is not wasted by a website that disappears. We need to do everything possible to ensure these words are available widely, and perhaps create situations where they will still be accessible once we are gone. And this is why the Text Realms system could change the landscape. Text Realms allows you to weave your worlds throughout the web on spaces you control, and on spaces that are committed to lasting beyond your years. How wonderful would it be if, in the year 2100, an updated version of this little program is used to stumble upon something written today in a forgotten corner of the internet? Something witty? Something inspiring? Something subversive and thought provoking? Some forgotten wisdom? For you, it would be magical as a reader. For you, it's your legacy as a writer.